The latest entrant into the online financial tools business is Google (GOOG), which launched Advisor last Thursday. In a clear, easy-to-read format the search engine offers a way to compare rates and offers from mortgage companies, credit cards, CDs and other financial products. For example, users can search for checking accounts and compare the best rates offered based on deposit amount, preferred account type (no monthly fee and interest checking) and proximity to a zip code. 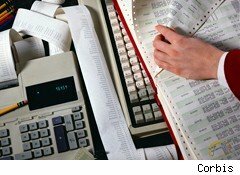 Search results display all the relevant details like ATM transaction charges, overdraft fees and interest rates. MyBankTracker.com is another website that offers tools to compare rates and find local banks. It also adds a social element, allowing users to review banks, and has an active community for sharing and discussing financial information or experiences. More tools for comparing rates and fees are available at CreditCards.com and LowerMyBills.com. 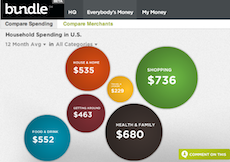 For comparing how and where people spend their money and how they save, Bundle.com offers a visually engaging tool called Everybody's Money. Drawing from a huge database of aggregated financial data, Everybody's Money allows you to pull back the curtain on how much your peers are spending on everything from rent to health care to restaurants. Users can also see how savings are allocated based on zip codes and other demographics. The results are telling. Compare the cost of living between Dallas and Chicago for an early 30-something married couple with kids: In Dallas, people spend around $100 a month more on house and home-related expenses (not including rent or mortgage) but $146 less on food and drink than in Chicago. Thinking about running away to Hawaii? You're in good company. Single guys, ages 24 to 35, in the Aloha state spend $405 on food and drink. Compare that to the same demographic living inside of the Beltway, where costs for food and drink add up to a whopping $752 a month (much of it spent at Starbucks). Why use all these tools? Jaidev Shergill, the CEO of Bundle, says the facts expose the real costs of living. "You can make better decisions through more transparency," he says. Catherine New is a reporter with the Huffington Post Media Group.